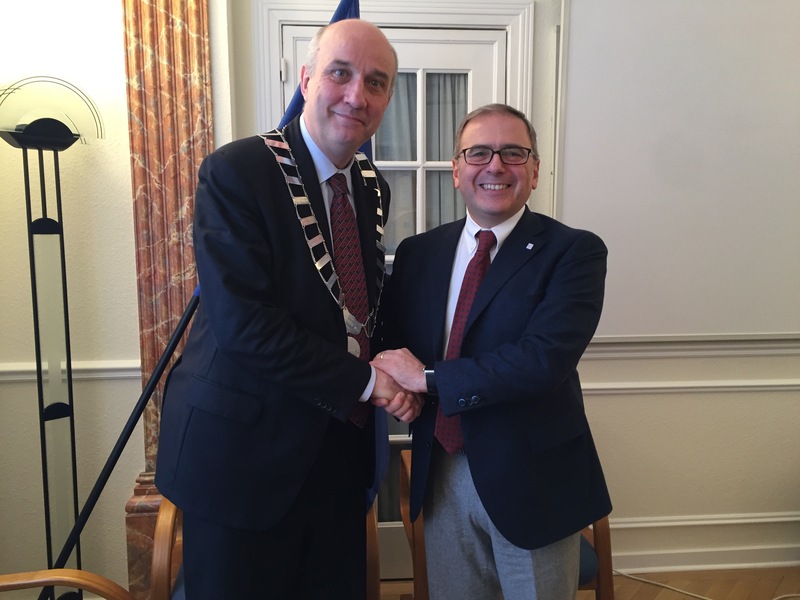 On 17 February, CED President Dr. Marco Landi met with the President of the Association for Dental Education in Europe (ADEE), Professor Paganelli. Building on their prior conversation during their meeting in January 2016, they continued the discussions on areas of interest for collaboration between practicing dentists and dental schools, including ethics, education and integrated care. Dr. Landi, together with CED Board member Dr. Paulo Melo, invited Professor Paganelli to attend the next CED General Meeting in Malta in May 2017, where the updated version of the CED Code of Ethics will be presented. Professor Paganelli was content to share that the updated version of the ADEE Profile and Competences for the Graduating European Dentist will also refer to the CED Code of Ethics in one of its revised four competences. Following up on the CED and ADEE agreement that it is important to focus on competences as the main tool for ensuring a high level of quality in education of dentists in the future, the Presidents reiterated the pivotal role of quality assurance in education, including an adequate clinical training for all the dental students, as part of the process leading to the overall enhancement of the health of all Europeans. Furthermore, the Presidents reviewed the CED Resolution on Annex 5.3.1 of the Professional Qualifications Directive which points out the need to update the list of study subjects for dentists, as an intermediate step towards a competences-based profile for the European Dentists. Integrated care is a topic of particular interest for the CED Working Group Oral Health. The trend at EU level towards integrated care and interprofessional education was seen as a positive development and both Presidents appreciated this as a further step in promoting oral health as an integral part of general health. Both organisations look forward to continue working on this topic together in the future. The CED and the ADEE look forward to further cooperating on these very important issues for the dental profession in the coming months and years.